EUGENE, Ore. – A new coalition of students, teachers, and workers at the University of Oregon rallied and marched Oct. 3 against rising tuition and plans to privatize governance of the university. The event drew over a hundred participants and observers to the student union amphitheater. Sponsored by LESST, the League of Educators and Students Slashing Tuition, the rally included a wide variety of speakers addressed the rising cost of higher education in Oregon and around the country. Judith Lechner, president of the Graduate Teaching Fellows Federation (AFT Local 3544, the graduate employees union at the University of Oregon), gave the opening remarks. A visiting scholar from Germany, she talked about how baffled she is by the lack of support for higher education in the United States. 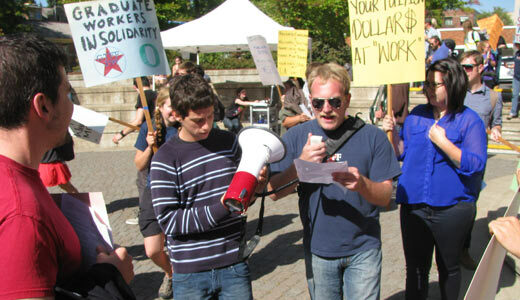 Michael King, board chair of the University of Oregon’s cultural center, noted that students in Quebec recently won a fight against rising tuition. “It’s our fight, too,” he said. Congressman Peter DeFazio, representing Oregon’s 4th Congressional District, also spoke, about the dismal state of support for students from the federal government. He pointed out that during the budget crisis last year, the one thing Republican lawmakers insisted on was cutting subsidized federal loans to graduate students. 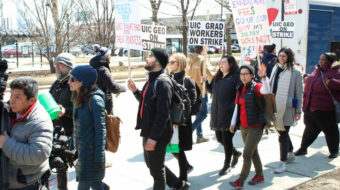 That was met with loud jeers from members of the graduate teaching fellows union, GTFF, who helped organize the rally. “A 1 percent addition to the taxes of people who earn over $350,000 a year would pay for the low-interest rates forever for national direct student loans,” DeFazio said. Gregory Rose, a retired professor and chairman of the Communist Party of Oregon, told the crowd that this issue demands activism and resistance from the current generation of students, likening it to the struggle against the Vietnam War a generation ago. After the speakers, organizers led the assembly on a march around the campus, chanting, “There ain’t no power like the power of the students, ‘cuz the power of the students don’t stop,” and “Hey hey, ho ho, student debt has got to go,” among others. As the march returned to the amphitheater, organizers emphasized that this was the start of a long campaign. Marchers distributed literature announcing a fundraiser for LESST, the student-teacher-worker coalition, at the Cowfish Dance Club on the evening of Friday, October 5, as well as a panel discussing the possibility of a tuition freeze at the Erb Memorial Union, on the evening of October 10.